What is Adina doing sailing backwards and forwards? Aren’t those two meant to be home by now? Have they changed their minds? When we signed Adina up to be shipped back to England by Sevenstar we were given a date for her to load anywhere between 5th and 15th May – quite a wide window but we geared up to be near St. Thomas in the US Virgin Islands (USVI), where she will be shipped from, in good time. We were told we should have a narrower window by mid-April. Late April we received the news that we’d be shipped on 8th May. We felt having a specific date must be good news as it sounded like accurate planning. The next day that date changed to 10th May. Then it changed back to 8th May on a different ship. Dates set in sinking sand. Regardless, we made our way to be close to St. Thomas. 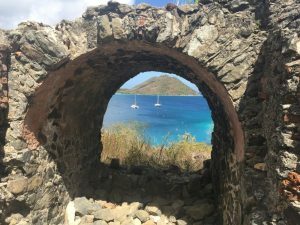 We took a commercial ferry over from the British Virgin Islands to activate our visas. Don’t ask, it’s complicated. Then we sailed Adina over to St. John in the USVI. St. John is a lovely island; most of the land forms part of a protected national park alongside some lovely private homes and the pleasant hub of Cruz Bay. 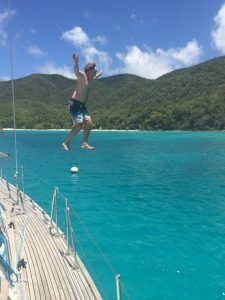 We based ourselves in a beautiful spot called Cinnamon Bay – think white sandy beaches, clear blue water with plenty of turtles, palm trees ashore, nice small hikes. We couldn’t ask for more as our trip wound to its end. We liked it so much we even delayed heading over to St. Thomas by a day. As part of our preparation for shipping we decided to have a test run of taking our stainless steel backstay off. This is what will need to happen on the day Adina is loadedto allow the crane to manoeuvre into place to lift Adina out of the water. Slings go underneath the boat and the boat is hoisted into a cradle on the ship’s deck where she is secured for the journey. The backstay works together with the forestay and shrouds to hold a sailing boat’s mast up. Without getting too complicated, our backstay is made from 10mm diameter stainless steel wire which runs from the top of mast before splitting off into two further separate 10mm wires secured to the deck at the back of the boat. As you can imagine there is a fair amount of tension involved in keeping the mast up and it’s a bit of a nerve-wracking experience to remove it as you hope the mast doesn’t topple over. It took the best part of three hours to remove and put back together and we could see the whole mast lean slightly forward. Not to worry, that’s what you’d expect to happen. We learnt from it all and made notes to ensure everything hopefully goes well on the big day – and that we can do it a bit faster! Wanting to see St. Thomas we headed over on 5th May as that would give us ample time to do some sightseeing and also get Adina ready for 8th May. No sooner had we dropped anchor than we received an email saying the shipping was pushed back to 10th May. We also learnt that twenty-five yachts would be loaded which takes around four days in total. The capital, Charlotte Amalie, didn’t have a lot to hold us there so we ventured around to see the docks and we could see another ship having yachts loaded onto it. The location of the docks is well sheltered from the wind but alas has a lot of local moorings with local boats taking up most of the space. We anchored in one spot and were then told a very large catamaran moors nearby so upped anchor and found another spot only for a small local ferry to come by with an old man grumbly informing us we were on his route “and I’ll be rockin’ you all night”. Feeling unwanted and vowing once more not to be grumpy in our old age, we decided to head off and venture back to the much prettier and friendly St. John. 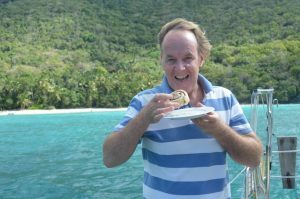 We stopped in a pretty little bay for one night on the way back and as the anchor finally settled Susie announced we had anchored five times that day. So Adina is back in lovely St. John and we have bought some more provisions to keep us going. Bear in mind the fridge and freezer will both be turned off on the ship so we have been running our supplies down. We are also meant to have as little fuel and water as possible. The latter is rather challenging when you need to drink, cook and shower and the shipping company keeps moving the date. We’ll get an update on the shipping on Monday 8th and are hoping we might also get some detail on what date we can expect to actually load. Until then we intend to stay in paradise and go swimming and hiking. If there is one thing we dread it’s that we have lived in warm weather for four years and that’s all about to change, so we’re making the most of it while we can! Look forward to your return – hope that you are both well and congratulations on finally completing the journey!